An excellent, well-rounded model with several features you don’t typically find in other brands. Recommended for: Anyone, although purists may prefer something with a proper steam wand. Especially recommended for those who prefer strong coffee. Are you a fan of one-touch convenience? Do you like strong coffee? 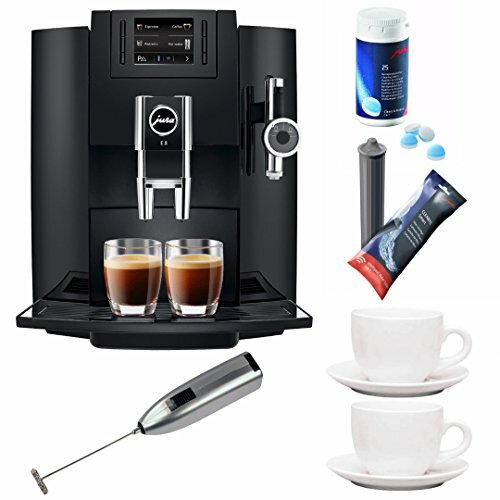 Are you in the market for a robust espresso machine that does most of the heavy lifting for you when it comes to making specialty coffee drinks while allowing enough customization that you can fine-tune the flavor to tailor it to your particular tastes? If so, and if you have some money to spend, then you’re going to love our Jura E8 Chrome review. Jura makes some of the best models in the industry, and while this one isn’t perfect, it has some advantages you just don’t find in other super automatic espresso machines offered by other companies. Whether you will pick this one or not ultimately comes down to what features you’re looking for, and what things are most important to you. Do you value convenience more, or are you looking for a machine that gives you fine-grained control over virtually every aspect of making your drink? Are you a power coffee drinker, or are one or two cups a day enough for you? Your answer to those kinds of questions will be the primary factor that guides you to the right machine for you. The E8 may or may not be a perfect match for you, but either way, we’ll delve into everything this model can and can’t do, so you’ve got a complete picture before making a final decision. Are you ready? Let’s jump right in! 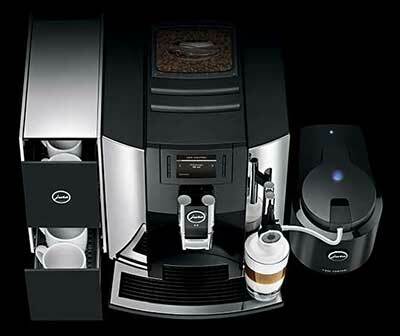 The first thing you’ll notice about the Jura E8 espresso machine is its color. It’s glossy black (piano black, with a few silver accents) and that’s the only color it’s available in. That’s something to keep in mind because you’re going to leave fingerprints on the unit every time you touch it! This is one of the advantages of more expensive machines that are made of brushed metal. Those models hide fingerprints very well. The other thing you’ll notice right away is the fact that it’s made of ABS plastic. It’s a sturdy material, but it’s just not as durable as machines built with more metal. If you take proper care of it, it’ll still provide you with years of reliable service, but more care is required. It’s not a compact model, measuring 18” x 16” x 14” and weighing in at 25 pounds, so depending on how much counter space you’ve got available, and how much clearance you have under your cabinets, it might be a bit of a challenge to find a permanent home for the machine. On the other hand, if you do have to move it about, given its relatively light weight, it won’t present a significant challenge. This is one of the many things we like about the model, and our Jura E8 Coffee Machine review wouldn’t be complete if we didn’t call special attention to it. It’s got an impressive 67-ounce water tank that can keep pace with even the most rabid coffee drinkers, or a large household with several casual drinkers. The tank is top loading and detaches from the left side of the unit as you’re looking at it, and when you make your purchase, you’ll also get a filter. It’s up to you whether you want to use the filter or not. If you do, you’ll cut down on routine maintenance, as it virtually eliminates the need for descaling. On the flip side, over time, it will dramatically increase your total cost of ownership, because those filters are expensive. Besides that, there are other ways to reduce your need to descale. For instance, if you already have a water filter attached to your kitchen sink, then the one in the Jura E8 coffee center is simply unnecessary. Also, you could just use distilled water and accomplish mostly the same thing. One thing that’s worth mentioning here is the fact that if you do opt to use the filter, the E8 is “smart.” It will detect the presence of the filter in the tank, and automatically let the machine’s operating system know it’s there. In most other models, you’ve got to manually update the filter/no filter setting, or the machine will still bug you about periodic descaling, but that’s not the case here, which is fabulous, and one less detail to worry about. The thing that makes super-automatic “super” is the fact that they are beans to brew systems. 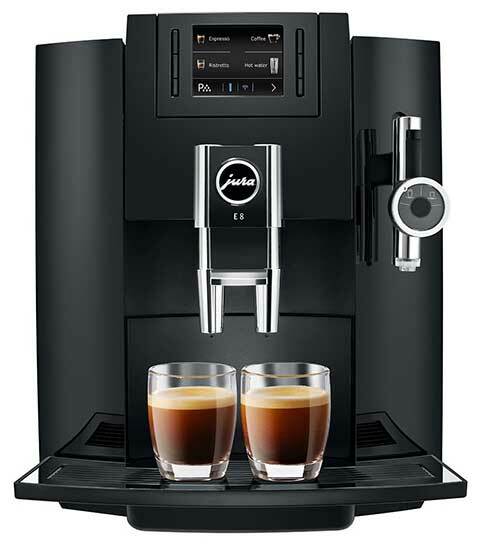 Everything you need to make a broad range of coffee drinks is all contained in one unit, and the Jura E8 automatic coffee center does a better than average job on this front. On the plus side, the grinder itself is a conical, ceramic burr design, which is far superior to its stainless-steel cousins. The reason is that stainless steel heats up when you use it, which can result in burnt coffee grounds, which can, in turn, ruin the flavor of whatever drink you’re making. On the average side, it’s only got six grind settings. That’s the industry average, so there’s nothing remarkable about it. Six isn’t bad, but finding the proper grind setting for you is an essential element of making a great cup of coffee, and making changes to your grind setting will dramatically impact the flavor of your coffee. More settings allow you to precisely dial into your preferred flavor settings, so more’s always better. While six is decent, it’s often not quite enough to allow you to tune the flavor of your coffee as much as you’d like. The top-loading bean hopper attached to the grinder is as impressive as the water reservoir, with a 12-ounce capacity. The two are well-paired in terms of size, which we regard as a very good thing. Two final notes to close out this section. 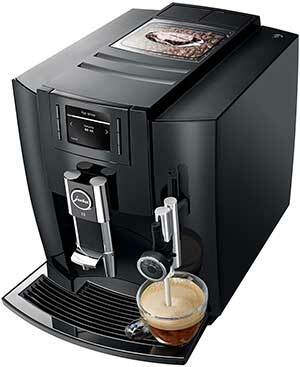 First, most Jura machines offer a two-scoop bypass doser, and the E8 follows this general pattern. That’s great because it allows you a quick, convenient way to enjoy a cup of coffee on those occasions when you don’t want to go through the whole process. A two-scoop bypass doser also allows you to make a really strong coffee, which is fantastic. While most super-automatic espresso machines offer a bypass doser, they’re almost always single-scoop capacity, which we find somewhat limiting. Second, and this isn’t something that’s unique to the E8, but applicable to super-automatics in general. They don’t do well with oily beans, which can clog the grinder and burn out the motor. For best results, you’ll want to find a good Medium Roast and stick with it. The increased brewing time isn’t horrendous. It’s measured in seconds, rather than minutes, but if you drink a lot of coffee, that extra time per drink can add up fast, so it is something that could influence your purchasing decision. This is, in our view, a relatively weak feature implementation, and an important part of our Jura E8 review is to highlight what we feel are design weaknesses when and where they are found. That’s okay, but if you’re a power drinker and have a jumbo-sized mug, you like using, just know in advance that it’s probably not going to fit under the spigot. Of course, you can always brew a double shot into two smaller cups, then pour them together, but now you’re dirtying three cups per drink, which adds to your clean up time. We’d much prefer to see a maximum height of 6, ” and this may be a deal breaker for some people. These two items are the heart and soul of every super-automatic, and the Jura E8 coffee center is no exception. There’s a lot to talk about in this section of our Jura E8 Chrome review, so we’ll take it from the top. The second big thing to point out here is that the E8 utilizes a new technology called PEP, which stands for Pulse Extraction Process. Overwhelmingly, the coffee people consume at home by the pot comes from a drip-brew system that uses gravity to get the coffee from the grounds chamber to your pot or cup. Espresso machines like the Jura E8 espresso machine don’t do that. They use pressure, as measured in bars. One bar of pressure is equal to atmospheric pressure at sea level. It takes at least 9 bars of pressure to make a good espresso, and the E8’s pump is rated at fifteen bars. 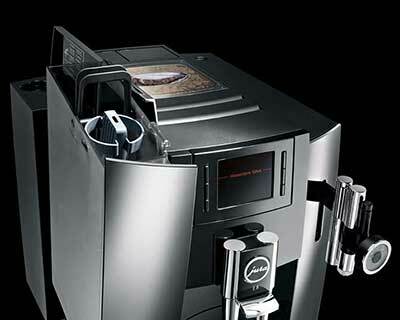 All that to say that you won’t have any trouble getting world class espresso from your machine, every time you use it. So how does all that relate to PEP? 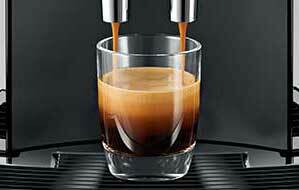 Well, unlike the conventional method of brewing espresso, which releases the water for the shot in a steady stream, PEP releases the water in a series of short, controlled bursts. It takes a few seconds longer to brew a shot, but the result is a more robust, full-bodied flavor. We regard that as a very good thing. In fact, PEP may be the most significantly advanced in super-automatic technology in years, and we’re glad to see it featured in the E8! As to the control system, there’s a lot to like on that front as well. First, the Jura E8 uses a brightly lit LED screen and has a well-organized system of menus, which makes navigating to any feature you want a snap. You can change the auto-shutoff time, access the various automated cleaning options, reset to factory defaults, change the language the machine uses, and of course, customize your various one-touch coffee drinks. For each coffee drink, you can set the amount of water used in the shot, the temperature the boiler should reach when making the drink, the shot time, and for milk-based drinks, you can also set the amount of foam and the volume of milk you’re getting. The biggest thing though is the ability to set the dose size, which is a measure of how many beans are grounded to make your drink. Most super-automatics offer five choices on this front, measured from one to five “beans” on the display screen. Once you get the drinks programmed the way you want them, the rest is one-touch ease and enjoyment. Where those drink settings are concerned, our recommendation is to try the factory default settings first, and if they’re not quite to your liking, make incremental changes as needed. It may take a while before you get it dialed in precisely, but that’s part of the fun! The E8 uses an auto-frothing system, rather than a steam wand, so right off the bat, coffee purists, who like the high degree of control that the frothing wand gives them, will probably take a negative view of this machine. While that part’s not so great, the rest of the frothing mechanism is, but the real star of the show is the froth dial, which allows you to adjust the amount of foam you’re getting. It doesn’t give you quite as much control as a proper steam wand, but it can come pretty close and is well worth experimenting with. Our only quibble here is that we wish the machine featured some way to affix a proper steam wand for those who simply prefer it over auto-frothing systems. Even if you had to buy it separately, that would still be a big win, and make the machine more appealing to a broader swath of the market. This will be a short section because the Jura E8 doesn’t have one. That’s a pity, and a missed opportunity in our book, because the cup warming tray is a lot more important than most people who are new to the world of specialty coffee drinks realize. 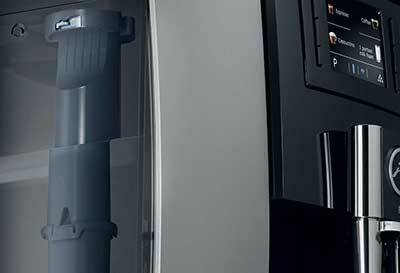 Its importance lies in the fact that when you dispense coffee into a cold cup, it loses heat. Add to that the fact that specialty drinks were meant to be enjoyed at temperatures lower than most Americans like their coffee, and it can be problematic, even if you set the boiler’s temperature setting to max. The cup warming tray helps minimize heat loss. Without it, your best option is to dispense hot water into your cup while you’re preparing the machine for use, then dump it in the drip tray when you’re ready to brew. It’s not an ideal solution, but it’s the only easy one you’ve got in this case. 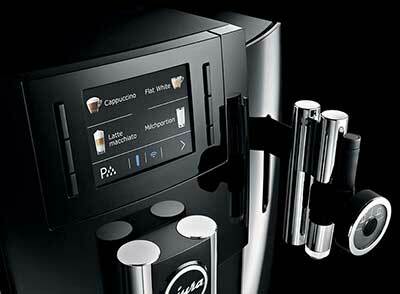 We’ve already sung the praises of the Jura E8’s menu and navigation system, so we won’t rehash that here. Suffice it to say that it’s top notch, and cuts the learning curve down to a minimum. Where the model really shines though, is in terms of cleaning. While it would be a mistake to say this is a self-cleaning machine, it does take care of a lot of the maintenance on its own, with limited input needed by you. It auto-rinses when you turn it on. It does it again when you power it down, and it runs a rinse cycle after every milk-based drink you make. This, on top of the fact that you can perform any of the automated maintenance routines from the control menu, any time you like. There are, of course, certain bits of manual maintenance you still need to perform. If you’re not using a filter, you’ll need to periodically descale. The dregs box and drip tray still have to be emptied at regular intervals, and you’ll need to remember to pop a cleansing tablet into the bypass doser about once a week to clean the brew unit. None of these things are difficult because all of the components are easy to access. Just make a list for yourself in the beginning, so you don’t forget anything. In a few weeks, it’ll become a habit, and you won’t even think about it. We said at the start that the E8 was a solid, but imperfect machine, and we think that our review to this point reflects that. More grind settings - So many of the E8’s features are a cut above; we just felt that the number of grind settings didn’t do the model justice. User profiles – One of this model’s biggest shortcomings is the fact that you can only save one person’s preferred settings per drink. If user profiles were implemented, each person could save their favorite espresso and latte macchiato settings separately, which would be awesome. A double boiler – this would raise the price but would cut down on your milk-based drink wait time. More range for the telescoping coffee spigots – a maximum cup height of 4.5” is too short for our liking. An optional frothing wand – This is simply to add to the model’s appeal where coffee purists who want more control are concerned. Less plastic, more metal – We don’t mind ABS plastic being used on the inside of the machine, but especially given its price, we do feel that at least the front face should be made of metal, and possibly the top as well, if not the entire unit. It would give it heft and added durability. Both are good things in our book. The absence of these things aren’t deal breakers for most people, but their presence would certainly strengthen the overall design. Someone who doesn’t want to hone their Barista skills (steam wand) but would rather let the machine do most of the heavy lifting. The more of these that apply to you, the more you’re apt to love this model. We recommend it then, with the understanding that at least half of these will apply to you. What's the Difference Between a Cup of Americano and a Cup of Drip Coffee? Driftaway Coffee. Buying Coffee Beans. Espresso Guy. How to Descale Your Espresso Machine. Quick Servant.